Mr. John J. Goller, aged 89, formerly of Rockford passed away Friday October 17, 2014. He was born June 16, 1925 in Solon Township, attended the former Briggs School and Cedar Springs High School. 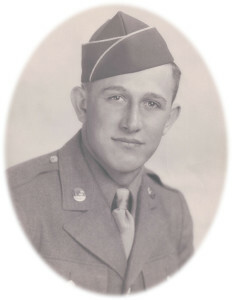 During WW II he served with the 35th Division, US Army and fought in the Battle of the Bulge. He was a member of the Rockford United Methodist Church, V.F.W. Post 3946 and Glenn Hill American Legion Post 287. Surviving are his wife Peggy; his sons and their wives John M. (Debra) Goller and David (Deborah) Goller; his grandchildren Andrea (Erich) Staman, Lynee’ (Pete) Buhl, Aelise Goller, Amy (Steve) VanBeekom, John D. Goller, Kathleen Goller; he was preceded in death by two brothers and one sister. Funeral services for Mr. Goller were held on Tuesday October 21, 2014 at 11:00 am in the Rockford United Methodist Church. Visitation was held on Monday, October 20th from 2-4 and 6-8 pm at the Pederson Funeral Home. Those desiring an expression of sympathy are asked to consider with the Rockford United Methodist Church or the Michigan Home for Veteran’s, 3000 Monroe N.E., Grand Rapids, MI 49505.